A sneak preview of the chain’s first outlet in N.H.
With the official opening only days away, workers at Whole Foods Market in Nashua is going into overdrive to make sure that everything is perfect for the 9:45 a.m. “bread-breaking” opening ceremony on Aug. 19 at its 225 Amherst St. location – its first in New Hampshire. Representatives from different media outlets were given a preview tour of the new 38,000-square-foot store on Thursday. With exposed brick walls and accents of bright teal paint, the “vibrant and fresh” decor is designed to mimic the industrial mill decor common in the area, said Jaimee Rondeau, marketing team leader and communication liaison for Whole Foods. Heather McCready, public relations manager for the Whole Foods Market North Atlantic Region, said that each store has its own unique look, including the overall color scheme to the font used to label each area around the store. They won’t be the only characteristics that set the store apart from the 387 others scattered throughout the U.S., Canada and United Kingdom. The shelves will be stocked with local and indigenous products. “We try to source locally whenever possible,” said McCready. Besides a cafe area and children’s corner, the store will be the only in New England to house J. Bartlett’s Public House, which will serve 32 craft beers on tap, wine by the glass and a variety of food. “[Whole Foods] is more than just shopping, it’s an experience,” said McCready. And with everything from meats, seafood, fresh produce and pasta to paper products, beauty supplies and clothing, McCready said the store’s inventory will always be shifting and evolving. Whole Foods will also be hosting guided sneak preview tours for the public from 8 a.m. to 2:30 p.m. on Saturday, Aug. 16. 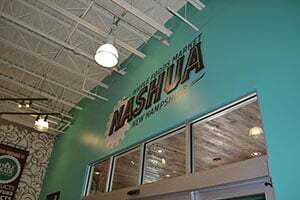 To register for a tour, visit nashua.wholefoodsrsvp.com. For more photos from NHBR’s Sneak Preview Tour, see the album on NHBR’s Facebook page.